With the 16th overall pick in 2007, Ernie Grunfeld took a flier on the kid from West L.A. with unteachable scoring instinct. The hope was that Young, with three years’ seasoning at the University of Southern California, would immediately replace who Jarvis Hayes never was, and that he would one day replace who DeShawn Stevenson and Roger Mason Jr. clearly were not. Lots of development teeth were lost along the way, but not all was bloody sockets. Especially under Flip Saunders, Young improved his ability to close out and contest shooters, his ability to fight through ball screens when chasing on defense, and his ability to be a spot-up shooter from long range. In fact, Young’s developed 3-point shooting (at least in volume) might be the main fiber his career is hanging onto at this point. Unfortunately, mental inefficiencies remained. Help defense and general defensive awareness stayed below average. Young’s ability to create for the team offense with his skills never developed, at all, infamously. All Young has ever wanted to do was get buckets, but it increasingly came at the cost of the team. Still, can we blame a blind man for selfishness? Eventually a goofy, easy-going demeanor needs to mature. And Young, perhaps the man and the game, just hasn’t grown up. In Washington (and in Los Angeles, one could argue), his game continues to shows that it’s hit a ceiling. Aside from free-throw percentage, none of Young’s stats have improved to any significance in this contract year. His 40.6-percent shooting in 40 games with Washington this season would have been a career-low. In 22 regular season games with the Clips, Young’s shooting fell to 39.4-percent. Going from being the man on a bad team to a role player on a good team hasn’t changed much. Maybe it’s his fault, maybe it’s the team development of the Wizards, maybe these things just happen in the NBA. After all, scorers in the League can come a dime a dozen. Judging the resume he’s built so far, Young’s career is only worth pennies on the dollar. But hey, with the career-high 43 points that he scored on January 11, 2011, at least Young should still have some buckets around for all the loose change. After testing the free-agent waters last year as a restricted free agent, Nick Young reluctantly returned to Washington on a one-year contract. This summer, as an unrestricted free agent, Nick should garner more interest from teams around the league. Though only averaging 8.1 points per game during the playoffs, Nick has had some big post-season moments which have endeared him to Clippers’ fans and to the organization (with other front offices watching). He’s shooting 52.6-percent on 3-pointers during this playoffs and has proven he’s not afraid of scoring on the big stage. Furthermore, Young’s “attitude issues” seem to have been resolved since his departure from Washington. Though his general demeanor has remained the same, smiling when winning sends a different message than smiling while losing. And his scowls, generally seen in Washington only as reactions to imagined slights by the referees or by teammates, are now reserved for his big-shot celebration faces. Still, Young may be disappointed in his long-term value to another team unless he can improve his ability to perform against pressuring defense. He’s not a very good ball-handler, so when defenders crowd him (or trap him), he has a tendency to lose control. This deficiency is exasperated by his historically bad passing ability. Though some would argue that he simply didn’t have the right pieces around him in Washington to pass, his disinterest in sharing the ball has continued in Los Angeles. Over 29 games with the Clippers, Young has accumulated a shockingly low 12 assists, which is about 50-percent less per 36 minutes than he achieved with the Wizards this season. Basically a free pick up at the trade deadline, the Clippers were surely expecting some better production from Young since his arrival, but that’s been his problem since he entered the league – he is too inconsistent. And the inconsistent play has led to inconsistent minutes in a Clippers uniform. In his time so far with his new club, he has averaged 27.2 minutes per game in March (nine games), 21 minutes in April (14 games, including one in playoffs), and 18.2 in May (six playoff games). For a quicker observation on Young’s inconsistency, a breakdown of his stats so far this postseason is all one needs. He was a huge spark in helping the Clippers win their first playoff game, scoring 19 points from 66.7-percent shooting (six-for-nine) in 24 minutes. He has since averaged just 6.3 points on 37.5-percent shooting (12-for-32) in the past six games, and the Clippers dropped three of them. His 13 points on 3-for-8 shooting off the bench in LA’s Game 7 win was by far his best performance since Game 1. For someone who has never averaged more than 1.2 assists per game or 2.7 rebounds per game, I find it difficult that the 9.7 points per game Young averaged with the Clippers during the regular season will be enough for them to retain him. This is mostly in consideration that Young was rumored to be looking for a deal worth around $9 million per season last summer before ultimately settling for the $3.7 million qualifying offer with the Wizards. Getting traded to a playoff team hasn’t done much to enhance the feasibility of Young’s asking price, it seems. In an upcoming offseason where other unrestricted free agents at the guard spot include Boston’s Ray Allen, New York’s Landry Fields, Atlanta’s Kirk Hinrich, Dallas’ Jason Terry and Milwaukee’s Carlos Delfino — possibly in addition to Portland’s Jamal Crawford ($5.2 million player option for next season) and Philadelphia’s Louis Williams (early termination option from $5.3 million) — Young could be in the same boat he was in last offseason, floating in a semi-sea-worthy dinghy without any wind in his sails. The LA native who calls himself “the best dressed man in the NBA” is now ready to step out and be the face of basketball style. “I haven’t really gotten the chance to get out there like that, but once people see me and really get into my style … I see people start to emulate it,” a charming Young says through a grin. It is his confidence, mostly, that sells his image. An image that includes what many players would never dare to step out in. Fitted jeans, vintage wool sweaters, prints and patterns, Nick Young never fails to make a bold statement with his wardrobe and though not everyone understands his look, he’s convinced that he can teach the fashion illiterate a thing or two. “They don’t really have style (in the league), I tell all the young boys coming up to get slimmer, lose the baggy clothes and all that stuff. There’s really nothing that can be done for the vets, they’re too stuck in their ways now,” says Nick. Young had his flaws as a player, and his exuberant manner of carrying himself opened him up to criticism when the team lost, similar to how Blatche’s high-profile clubbing behavior provided additional ammo for his hordes of detractors. However, Nick was always gracious in post game media sessions, and even when grinning while spitting out non-sequitur answers, he genuinely hurt after losses. Early this season, the Wizards were already stinking and John Wall was mired in a scoring slump. In the locker room before a game, the team’s young franchise building block complained how he scored more in his second career game (28 points versus Atlanta) than he had in any contest, weeks into his sophomore campaign. Young interrupted Wall and stressed to him that he cannot, in any way, worry about stuff like that. Young told Wall that he should keep playing his game and that good things will eventually come. This was not done in front of the cameras nor to draw attention, it was just a vet providing a younger player with sage advice. In digesting Young’s stern yet encouraging words, the look on Wall’s frustrated face flipped to relief. Not long after this conversation, Wall busted out of his drought with a huge second half versus the Philadelphia 76ers and then with a dominant Martin Luther King Day performance versus the Houston Rockets. Behind the deep-V designer T’s, skinny jeans, eccentric hair styles and unique engaging humor, there was a quiet leader in Young who wanted to be better teammate. He just wasn’t equipped with a persona that people could always take seriously. 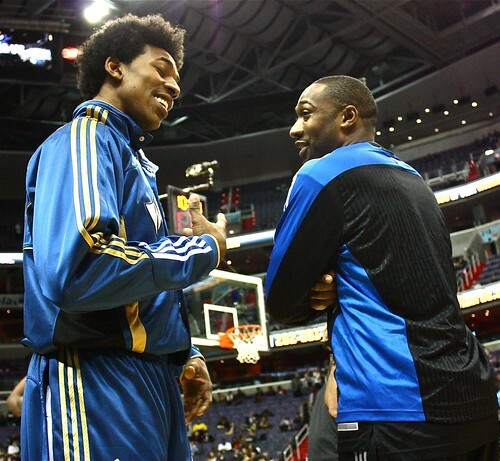 The memories of Young’s days with the Wizards will be mixed. Maybe with a stronger supporting cast and a lesser role, Young would be viewed in a more positive light by fans, instead of being indirectly blamed for Washington’s poor record. 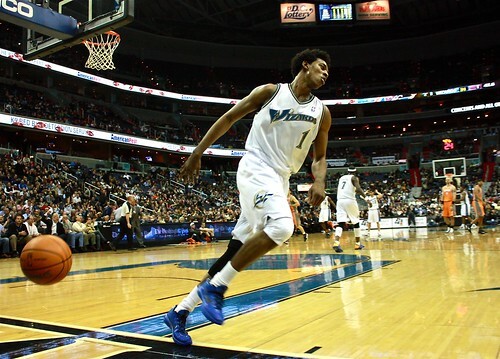 The man could flat out score, and Nick Young heat checks sure could be fun to watch. It is only fitting that Young ended up back home in L.A., where his flashy playoffs ensemble proved that Swaggy P will continue to bring the swag, no matter what. 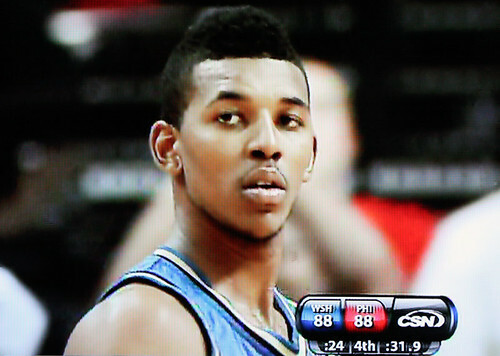 HOW COULD WE FORGET NICK YOUNG & HIS FOX TAIL?